Vipp pedal bins are design classics and known for its classical and aesthetic simplicity. 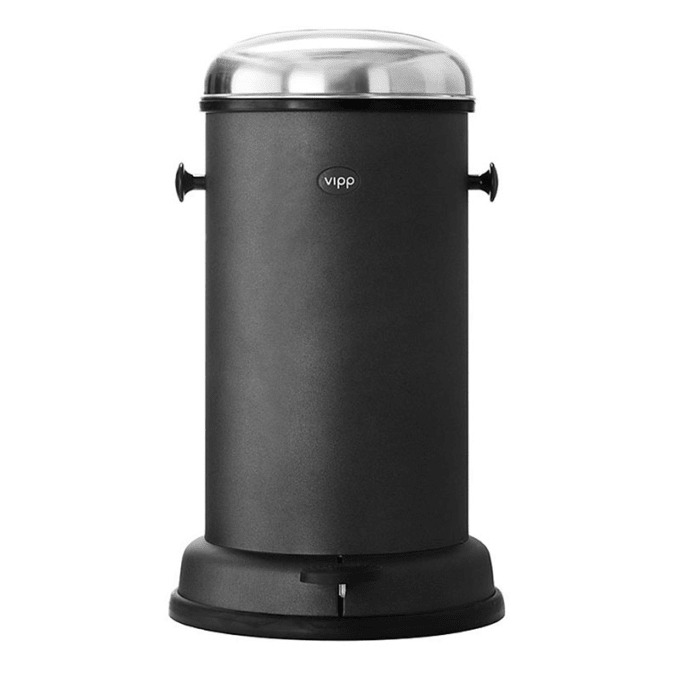 The Vipp pedal bin is made with a layer of stainless steel and equipped with a damper mechanism for smooth closing of the lid as well as a rubber ring that guarantees air-tight closure. The body is manufactured in powder-coated steel and hides the removable, galvanised steel inner bin. A rubber ring at the base ensures that sensitive surfaces are safeguarded. Warranty: 10-year warranty. The extended warranty for bins applies to products purchased in 2008 or later. The warranty assumes that the product has been properly used as described under ‘Care Instructions’, with reservations for normal wear and tear. A 2-year warranty applies to bins purchased before 2008. Care instructions: Stainless steel surfaces should be cleaned and polished with a microfibre cloth, glass cleaner or other non-abrasive and gentle cleaning agents. Lacquered surfaces should be cleaned with a moist cloth. Rubber parts should be cleaned with a moist cloth. Apply silicone spray for better finish. Vipp products with dark surfaces should be cleaned with a soft brush and, if stained, with a bit of water. Then wipe with dry cloth. Do you have a question about "Vipp 15 (14l)"? How can we contact you?